There was less of a crowd than I had expected at the Bowie show in Melbourne today. Those of us there waited expectantly, as our tickets were checked and we were allocated headphones and a recording device. The crowd had grown during this process but filed quietly into the doorway that marked the beginning of this amazing retrospective. Almost reverently, with bowed heads, the assembled shuffled into the space, reading about the life and times of this amazing artist. Had I closed my eyes while I listened to Space Oddity I may have been 15 again, sitting in my bedroom with a cassette recorder listening for the first time. But I could not close my eyes as there was much to see – from the video of the song with the strange angular, thin man with crazy orange spiky hair and funny eyes to the sheet music from which it had all evolved to photos of the time – the moon landing and the photograph of earth from the moon. Maybe, because this had happened on my 10th birthday I was somehow more connected to the event and the song that had been (paradoxically) used at the time to underscore it. Maybe it just came at a time when I was most impressionable. Whatever the reason, ever since I heard that song I have been enamoured of Bowie’s music and art and his ability as a showman. 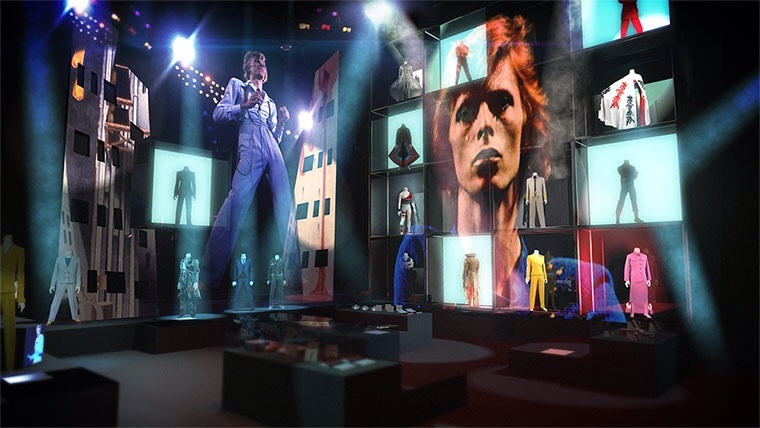 How he managed to bring the avant garde to the masses and his ability to metamorphose himself into different characters, at a time when other artists took the easy road and repeated themselves until they lapsed from mediocrity to insignificance – well it beggared belief. His greatest design was and is himself and it it this design and his influence on culture that is presented at this show. And what a show it is – here is a taste. 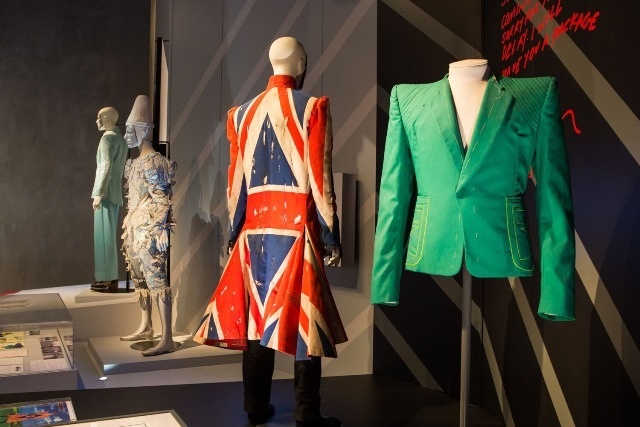 Many of the costumes used in his music videos and on album covers were here – looking strangely still on faceless mannequins. He must be a small man – not very tall and quite a petite frame – I thought the same when I saw Admiral Nelson’s uniform at the museum in Greenwich but of course both men had no need of physical stature. Apparently there is a vast archive of his belongings – like Warhol (another person who needs only one name) he must have kept everything from the significant to the everyday. There are posters and rough notes for songs, costume designs and lighting plans for concerts. Such was his certainty that he would be famous he clearly kept it all. And good thing too. 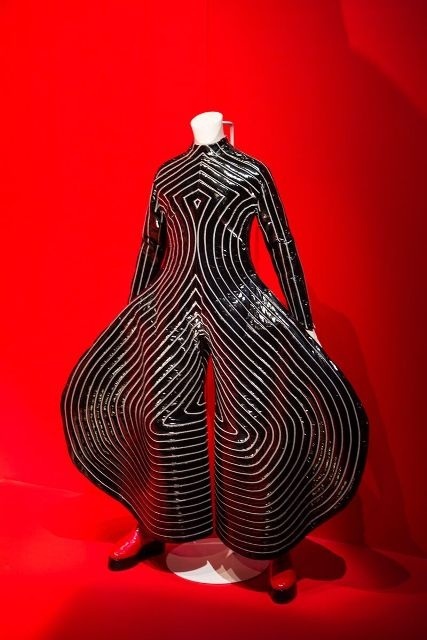 The iconic Aladdin Sane woollen costume by Kanzai Yamamoto looked vaguely sinister without the mannequin inside don’t you think? And what has this to do with quilting? Well Bowie was certainly an influence for many musicians but he also influenced modern culture. 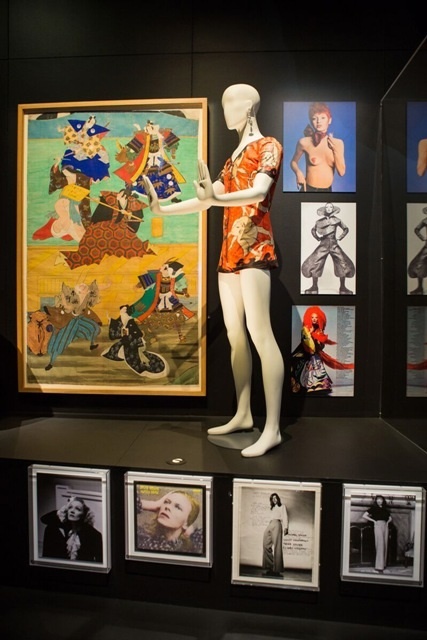 Was his interest in the Kabuki theatre, the fashion and the Japanese culture something that led to the popularity of Sashiko and Japanese textiles? Possibly. When he dressed in suits that had a female cut did that somehow lead us to the modern penchant for asymmetrical design? Maybe. And did his interest in the use of unusual cloth such as knitwear or sparkle lead us to innovations in the texture of art quilts and their ilk? I like to think so. This entry was posted in Events, Uncategorized and tagged Bowie by Apatchy Kaye. Bookmark the permalink. It’s worth taking a trip down to see it – and Melbourne is wonderful of course! Kaye just catching up. Love all your blogs. Be there next Tuesday. Lorraine.